The engraving on banknote is made after this photo of Manuel Roxas. 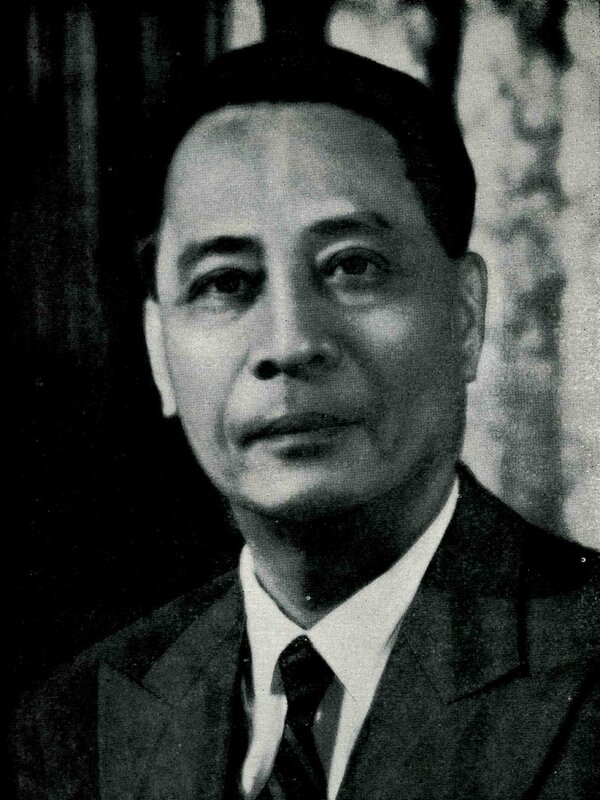 Manuel Acuña Roxas (born Manuel Róxas y Acuña; January 1, 1892 - April 15, 1948) was the fifth President of the Philippines who served from 1946 until his death in 1948. He briefly served as the third and last President of the Commonwealth of the Philippines from May 28, 1946 to July 4, 1946, subsequently becoming the first President of the independent Third Philippine Republic after the United States ceded its sovereignty over the Philippines. 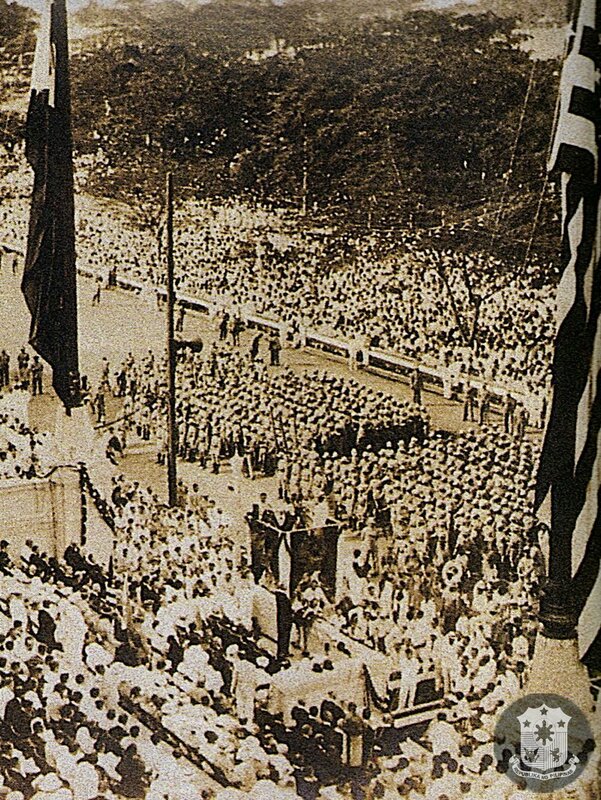 At the bottom, centered, is Inauguration of the Third Philippine Republic at 4 of July 1946, when independence from the USA was proclaimed. The date was chosen by the United States due to the fact that it coincided with the United States Independence Day; in the Philippines, this day was celebrated as Independence Day until 1962. 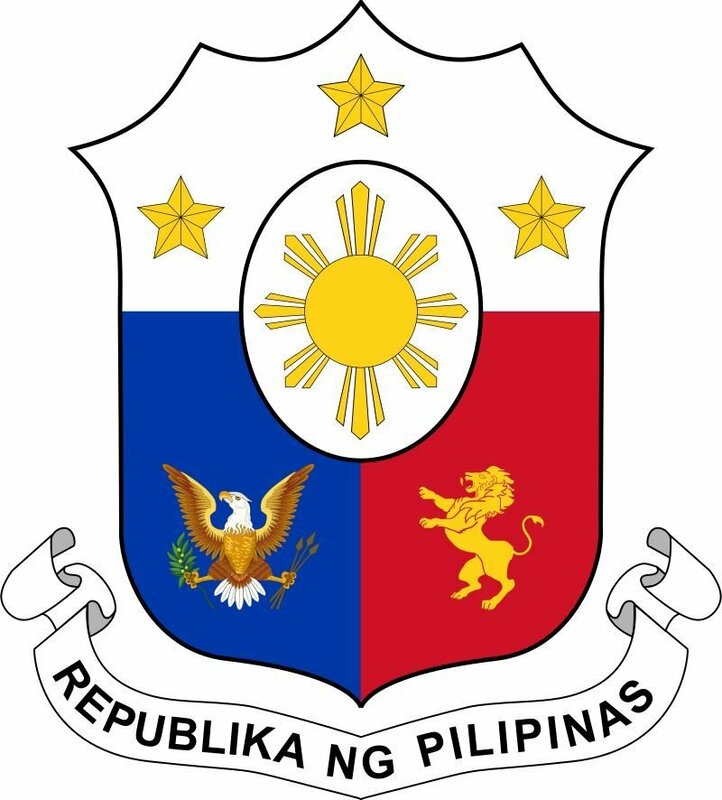 Proclaiming the Third republic, The Treaty of Manila of 1946, formally the Treaty of General Relations and Protocol, is a treaty of general relations signed on 4 July 1946 in Manila, the capital city of the Philippines. It relinquished U.S. sovereignty over the Philippines and recognized the independence of the Republic of the Philippines. The treaty was signed by High Commissioner Paul V. McNutt as a representative of the United States and President Manuel Roxas representing the Philippines. It was signed by President Truman on 14 August 1946б after the U.S. Senate gave its advice and consent on 31 July 1946 by ratification of the treaty. It was ratified by the Philippines on 30 September 1946. The treaty entered into force on 22 October 1946, when ratifications were exchanged. The treaty was accompanied by a "provisional agreement concerning friendly relations and diplomatic and consular representation" (60 Stat. 1800, TIAS 1539, 6 UNTS 335) until the treaty was ratified. On left side is the facade of the old building of the Bank of the Philippines (originally the Customs House or Aduana) after the drawing of its architect, Thomas Cortes. The Aduana Building, also known as the Intendencia, was a Spanish colonial structure in Manila, Philippines that housed several government offices through the years. It is located in front of the BPI Intramuros (formerly the site of the old Santo Domingo Church) at Plaza España, Soriano (Aduana) Ave. corner Muralla St. in Intramuros. This two-storey governmental structure follows a Neo-Classical tradition, with an emphasized horizontality and symmetrical form, particularly on the design of its façade. The central bay had three arched entrances and two principal staircases built around the two atriums. ]The rectangular fenestration on the upper most story were decorated with rustication. The window-like portals opening out to small balconies were framed with pilasters topped with ornate capitals and were adorned with elaborate geometrical grillework. Similar ornate grillework also decorated the main entryways in the building. The Aduana, or Custom House, was built in Intramuros to attract merchants to remain within its walls rather than outside of it. Records show that in 1822, a Spanish engineer Tomás Cortes took charge of the project and began its construction in 1823. Despite objections due to insufficient space for warehousing and its distance from the port, the construction continued until its completion in 1829. However, in 1863 the Aduana suffered damages from an earthquake, which led to its demolition in 1872. Reconstruction of the building was later awarded to Luis Perez Yap-Sionjue, which began in 1874 and was completed in 1876. 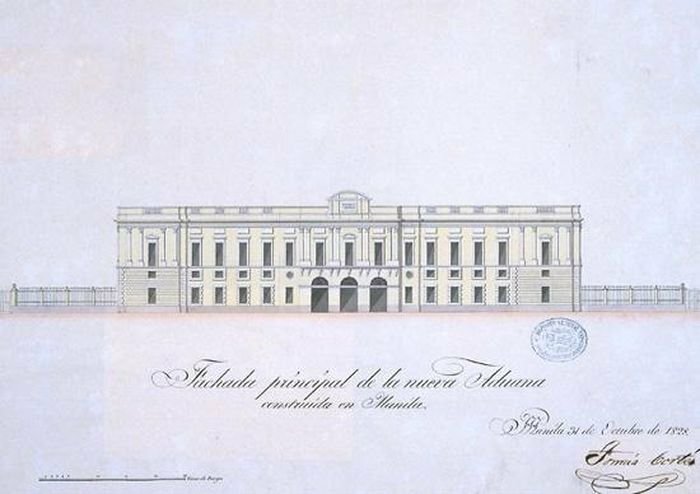 The rebuilding of the structure was still based from the original design of Cortes but it has now housed the Custom Offices, the Civil Administration Office (Intendencia General de Hacienda), the Treasury, and the Mint House (Casa de Moneda). 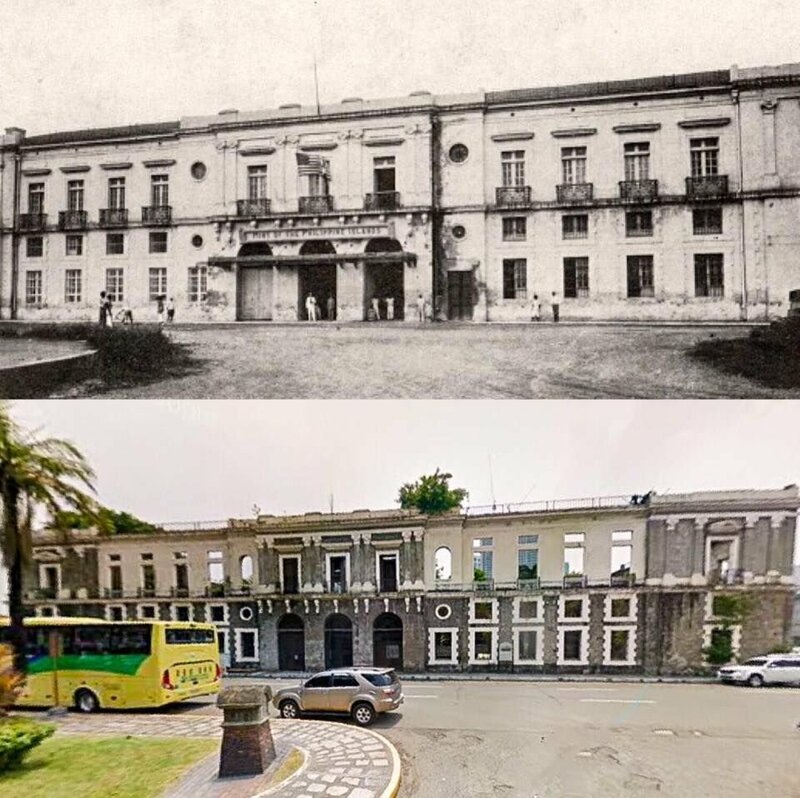 When the Customs transferred, the offices of the Mint House and Treasury remained in the building and was renamed as Intendencia. During World War II, the building once again suffered damages; first by the Japanese bombings in 1941 and later on by the American and Filipino military artillery during the Battle of Manila of 1945. It was repaired after the war and functioned as the Offices of the Central Bank of the Philippines, the National Treasury and eventually the Commission on Elections. Its eventual abandonment was in 1979 when the building was ravaged by fire. In 1997, the National Archives acquired the building to serve as their future office. Restoration efforts have already commenced as to date. 1) Mayon Volcano in Albay. 2) Rhincodon typus, butanding (whale shark). 3) Albay (Bicol) textile design. 4) Map of the Philippines with a marked province of Albay. Mayon (Central Bicolano: Bulkan Mayon, Filipino: Bulkang Mayon, Spanish: Monte Mayón), also known as Mayon Volcano or Mount Mayon, is an active stratovolcano in the province of Albay in Bicol Region, on the large island of Luzon in the Philippines. Renowned as the "perfect cone" because of its symmetric conical shape, the volcano with its surrounding landscape was declared a national park on July 20, 1938, the first in the nation. 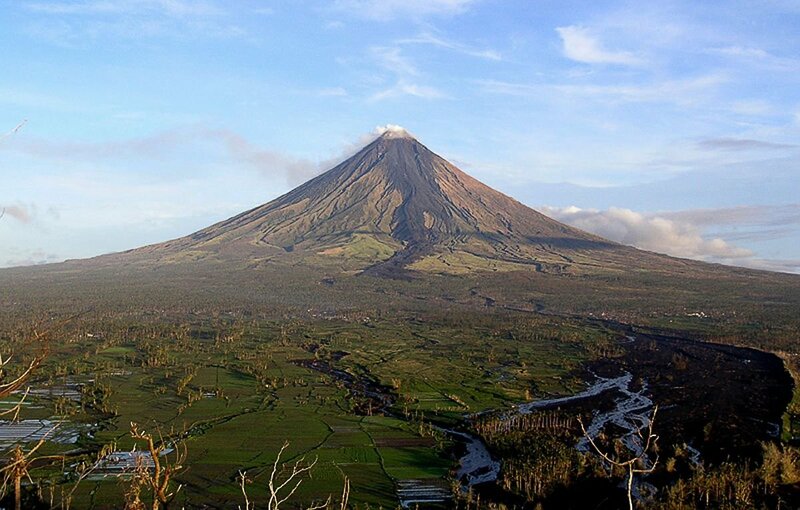 It was reclassified a Natural Park and renamed as the Mayon Volcano Natural Park in 2000. Local folklore refers to the volcano being named after the legendary princess-heroine Daragang Magayon (English: Beautiful Lady). Numerous festivals and rituals are associated with the volcano and its landscape. The volcano is the centerpiece of the Albay Biosphere Reserve, declared by UNESCO in 2016. The whale shark (Rhincodon typus) is a slow-moving, filter-feeding carpet shark and the largest known extant fish species. The largest confirmed individual had a length of 12.65 m. (41.5 ft.) and a weight of about 21.5 t. (47,000 lb.). The whale shark holds many records for sheer size in the animal kingdom, most notably being by far the largest living nonmammalian vertebrate. It is the sole member of the genus Rhincodon and the only extant member of the family Rhincodontidae which belongs to the subclass Elasmobranchii in the class Chondrichthyes. Before 1984 it was classified as Rhiniodon into Rhinodontidae. The species originated about 60 million years ago. The whale shark is found in open waters of the tropical oceans and is rarely found in water below 21 °C (70 °F). Modeling suggests a lifespan of about 70 years, but measurements have proven difficult. 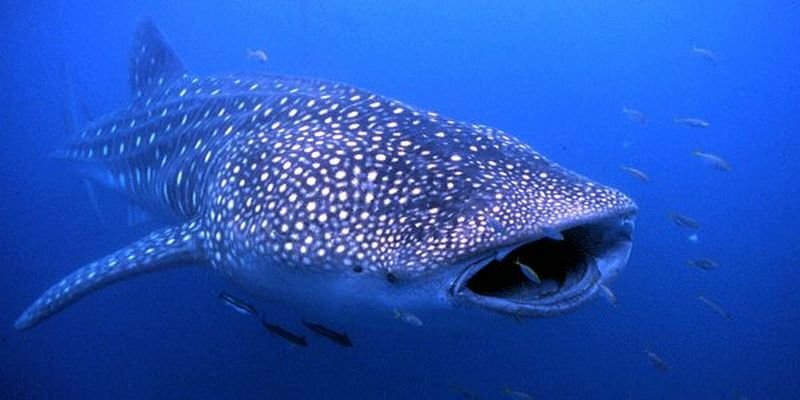 Whale sharks have very large mouths and are filter feeders, which is a feeding mode that occurs in only two other sharks, the megamouth shark and the basking shark. They feed almost exclusively on plankton and are not known to pose a threat to humans. The species was distinguished in April 1828 after the harpooning of a 4.6 m. (15 ft.) specimen in Table Bay, South Africa. Andrew Smith, a military doctor associated with British troops stationed in Cape Town, described it the following year. The name "whale shark" refers to the fish's size, being as large as some species of whales, and also to its being a filter feeder like baleen whales. Across all field of banknote is Albay (Bicol) textile design.